From 1993 to 1997 over 5000 Sooty Tern chicks were ringed on Bird Island before they fledged. 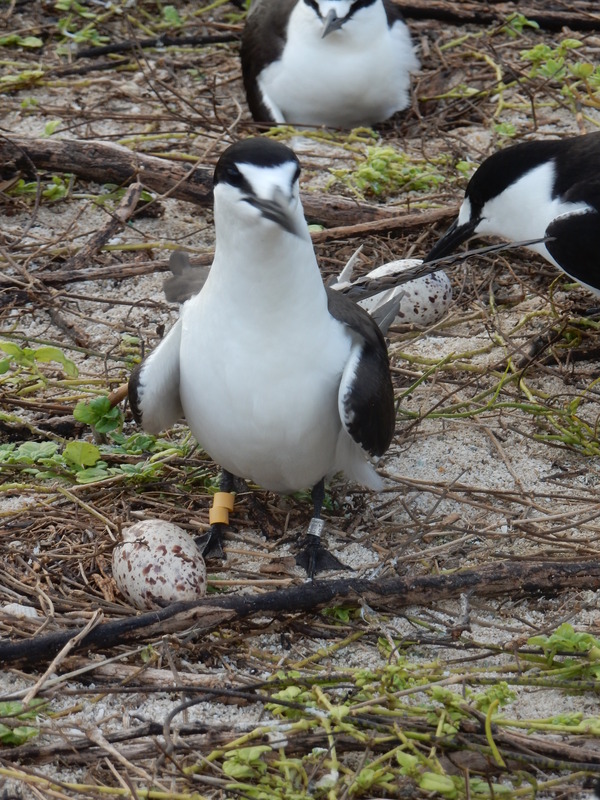 Each chick was given a coloured ring of a special plastic called “Darvic”, which was believed to be sufficiently resilient to be suitable for long-tern studies of birds. In 1993 and 1997, each chick was also given a metal, individually numbered, ring obtained from the British Trust for Ornithology. As we searched for these ringed birds in later years (most young Sooty Terns do not return to breed until they are 5-6 years old) it became apparent that the Darvic rings did not survive well on Sooty Terns. When we caught birds that were wearing them we discovered the Darvic had become brittle and some of the rings broke off as we were handling the birds. When we caught Sooty Terns that had also been given metal rings we discovered that most of the Darvic rings had been lost, indicating that this material was indeed unsuitable for marking Sooty Terns for studies lasting several years. On 29 June this year I was walking slowly through the Bird Island colony looking for birds carrying metal rings in order to catch and identify each one through its number. It was a great surprise to be confronted with an incubating bird wearing a metal ring on its left leg and two yellow Darvic rings on its right leg. The two Darvic rings on the right leg signified that the bird had been ringed as a chick in 1997, a fact confirmed by the number on the metal ring. That the bird still retained both of its Darvic rings was remarkable and it is probably the only bird in the colony still to be carrying both of its yellow rings after 19 years – a great rarity! Both Darvic rings were brittle, however, and it looked as though they would not last much longer.